The Punjab Chief Minister, Capt Amarinder Singh, seems to have adopted “double standard” for selecting Congress candidates for the coming Lok Sabha elections. Slogans of “Inqlab Zindabad, Vande Matram and Jab tak suraj chand rahega Bhagat Singh tera naam rahega” were raised as the Punjabi Sabhyachar Manch organised a march to observe the martyrdom day of Shaheed-e-Azam Bhagat Singh, Rajguru and Sukhdev here this morning. 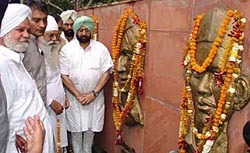 Subjecting the “India Shining” slogan of the BJP to satire, the Punjab Chief Minister, Capt Amarinder Singh, today said India was shining for just two per cent of top and influential BJP leaders and not for over 30 crore countrymen, who were still living below the poverty line. More than 40 years after residential colonies came up in the area within 1,000 yards from the periphery of the Ammunition Sub Depot (2 ASD), Mamun, the Army authorities have served notices, asking people to stop construction with immediate effect. A long waiting period proved a major drawback for the special train to Lahore for cricket fans as less than 100 passengers arrived here from Delhi today to watch the final of the one-day international cricket series to be played in Lahore tomorrow. Shiromani Akali Dal (Amritsar) president Simranjit Singh Mann has received a reply from French Foreign Minister Dominique de Villepin on the turban issue that he had raised with him. Mr Villepin informed that the “law project on turban will not be in effect until the following school season in September and hence this time should be used in removing all kinds of misunderstanding”. In a massive fraud, eight men took BSNL Cell One mobile connections simultaneously, ran up bills amounting to Rs 80 lakh in February and disappeared. BSNL has been left high and dry as the men had given fake addresses in their application forms. A former Punjab minister, Mr Inderjit Singh Zira, who has revived the Shiromani Akali Dal (Longowal) in the recent past, said yesterday that he was of the opinion that all Akali Dals and other secular forces should join hands to field common candidates against the SAD-BJP alliance and Congress candidates in the forthcoming Lok Sabha elections. The election campaign of Mr Sukhdev Singh Dhindsa, Shiromani Akali Dal candidate for the Sangrur parliamentary constituency, today got a shot in the arm with leaders of the Barnala faction starting campaign in favour of Mr Dhindsa. Mr Baldev Singh Mann, general secretary of the SAD and a close confidant of Mr Surjit Singh Barnala, kicked off the campaign from Mehlan village. Former Chief Minister and President, SAD, Parkash Singh Badal has appealed to publishers of various newspapers to not carry any derogatory advertisements against him and his family members without verifying facts. Dr Malti Thapar a former Congress minister, while accusing BJP leadership, including the Prime Minister, Mr Atal Bihari Vajpayee, of indulging in personal attack on Ms Sonia Gandhi and her family members in their election campaign, yesterday claimed that only a selected few, who had unaccounted wealth, were “feeling good” under the rule of the BJP-led NDA government. Shiv Sena (Bal Thackeray), Punjab, vice-president Pawan Parbhakar and its chief spokesman Jagdish Kataria have claimed that the Shiv Sena will not make any poll alliance with any political party. Owing to high cost of power industrial units in Punjab are exploring the possibilities of buying cheap power from other states due to the opportunities available after the passing of the electricity Bill, 2003. Town planners participating in the national seminar on “Challanges and priorities in urban and regional planning” were of the unanimous opinion that geographical advantages like gas pipeline from Iran to Punjab should be exploited to make the economy of the country strong. The local public library today held a book exhibition which was inaugurated by Mr D.P.S. Kharbanda, Additional Deputy Commissioner (Development). Mr Kharbanda said reading was a good habit. Reading books was like chatting with intelligent people. The Sacha Sauda Society, Canada, will take 150 volumes of Guru Granth Sahib in a chartered plane to Canada on April 3. Taking up a petition filed by Member of Parliament Simranjit Singh Mann seeking directions for shifting Prime Minister’s residence from Race Course Road to any other “safer place” will come up for hearing on April 6. The petition was filed in less than a fortnight after Punjab Chief Minister’s aircraft hovered over the Prime Minister’s residence. The Jalandhar police has busted a six-member inter-district gang of bank robbers and kidnappers by arresting all its members and recovering firearms, cash and vehicles used in crime from their possession. The Sadar police has booked Sheokaran, a resident of Kula village in this subdivision, for allegedly strangling his wife to death, official sources said this evening. Senior Congress leader and Punjab Mandi Board Chairman Sant Ram Singla has been appointed a member of the Punjabi University Senate.